Icelandic conductor and composer Daníel Bjarnason is currently artist in residence with the Iceland Symphony Orchestra. From season 16/17, Daniel will be composer in residence at the Muziekgebouw Frits Philips Eindhoven. A co-curator of the Los Angeles Philharmonic’s Reykjavik Festival, Daniel will be featured as both a conductor and composer in Los Angeles in April 2017. Recent and upcoming commissions include works for the Los Angeles Philharmonic, Cincinnati Symphony Orchestra, Rambert Dance Company, Britten Sinfonia, Jennifer Koh, So Percussion, Calefax and the Calder Quartet. Daníel is writing his first opera for the Danish National Opera in Aarhus and will be premiered in August 2017 as part of the Aarhus – Culture Capital of Europe celebrations. Based on the Susanne Bier film Brothers, the opera will be directed by Kasper Holten, and Steffen Aarfing will create the stage design. The librettist is Kerstin Perski. Daníel Bjarnason’s music has been described as “coming eerily close to defining classical music’s undefinable brave new world” (Time Out New York), under conductors such as Esa-Pekka Salonen, Gustavo Dudamel, John Adams James Conlon, André de Ridder, Louis Langree and Ilan Volkov in venues such as Walt Disney Concert Hall, Lincoln Center, Harpa and the Barbican. Daníel’s versatility has also led to collaborations with a broad array of musicians outside the classical field including Sigur Rós, Brian Eno and Ben Frost. 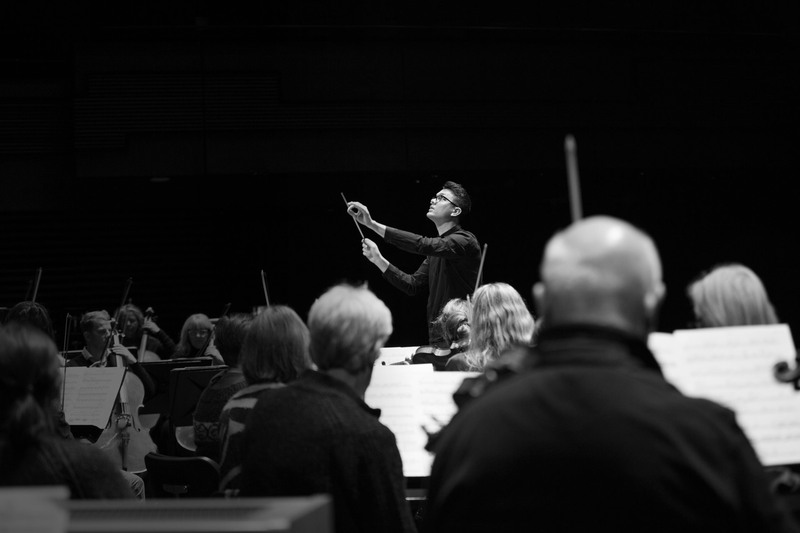 Recent and upcoming conducting engagements include appearances with the Los Angeles Philharmonic, BBC Philharmonic, Iceland Symphony Orchestra, Tokyo Symphony Orchestra, Toronto Symphony Orchestra, Ulster Orchestra, Sinfonietta Cracovia and The Icelandic Opera. Bjarnason’s work has been recognised on numerous occasions at the the Icelandic Music Awards. This year with the Iceland Symphony Orchestra and Iceland Opera, he received the award for Best Performer for their performance of Peter Grimes. Previously he won Best Composer/Best Composition in 2010 for Processions and Composer of the Year, 2013 for his works The Isle Is Full of Noises and Over Light Earth. Also in 2013, he and Ben Frost won the Edda Award for best soundtrack for their score to film The Deep, directed by Baltasar Kormákur. After studying piano, composition and conducting in Reykjavík, Daníel Bjarnason pursued further studies in orchestral conducting at University of Music Freiburg. Daniel is a member of Bedroom Community, the Icelandic record label and close-knit collective comprising nine like-minded, yet diverse musicians from different corners of the globe. Daníel Bjarnason is published by Peters Edition.